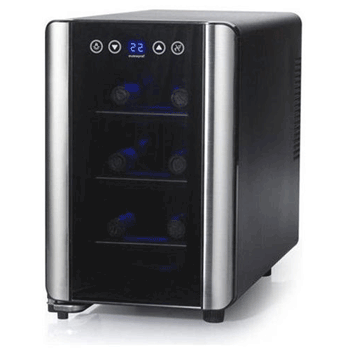 Truth be told, this is one of the best-looking wine coolers we’ve ever seen and had the pleasure of testing. It reeks of the type of design pedigree of an electronic products brand that’s been playing the field for over three decades. After putting it through its paces with the aim of putting together a comprehensive Haier 6-Bottle Wine Cellar review (with electronic controls), there is very little wonder why this cooler has instantly proven to be a hit with all sorts of wine enthusiasts around the world, providing a very classy way to store and display six of their favorite bottles. 10/10 for the design on this six-bottle beauty of a cooler! Unless your taste is especially anti-modern, you can’t help but stare at the front-facing glass door of one of Haier’s finest coolers. Depending on the bottles you store (if you store red bottles) looking through the smoky glass, curved pane door appears as if you’re looking at a digital screen with crystal clear, high-definition pictures of some inviting wine bottles. Yes, it’s that good-looking, with its black or silver (we had the black one) color enhanced by the recessed door handle. It will look great on your countertop without fail. Going beyond its futuristic appearance, you’d probably buy a six-bottle cooler with the idea of chilling just a few of your favorite red or white wines. The single zone cooling compartment is controlled with a digital thermostat and there’s a blue LCD display that reports the temperature. A nice blue interior LED light illuminates the bottles very beautifully (partial illumination from the center radiating outwards). The cooler draws 115V of power at 60Hz and is rear-ventilated. It’s truly compact at a weight of 17.6 lbs. and a volume of 9.9” (W) x 14.1” (H) x 20.3” (D). It is a 1-UL and CSA listed cooler with a 1-year warranty for domestic use or 90-day warranty for rental or commercial use. This Haier cooler offers compact cooling at its best, featuring smart electrical usage technology to ensure that the cooling settings always operate optimally while saving as much electricity as possible. In practice, this means that even if you leave the door open for a few minutes (for whatever reason), as soon as you close it again the temperature very swiftly adjusts right back to your original settings with precision. An integrated lock will keep your loot safely tucked away from overeager hands, while the single cooling zone has a true temperature range of 45-55 degrees Fahrenheit. In all honestly, you can store both reds and whites (if you keep the temperature at around 55), but that leaves very little room for temperature fluctuations which would otherwise be too high for white wines. So if you have to choose to either store reds or whites, it would be better suited for white wines (and sparkling wines) as it might be too cold for some delicate reds and too warm for some equally sensitive whites. You can definitely store both varieties at the same time though (at around 55 F). 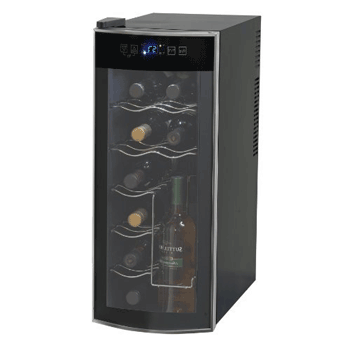 If you’re a beginner wine collector and you don’t have a big collection, this is a great starter wine cooler, otherwise, wine connoisseurs with bigger collections might find this a bit too small for the investment. If capacity played no part in the functionality, however, even the most seasoned of wine enthusiasts would find it very hard to resist adding this cooler to their interior space countertops. It’s solid, extremely compact and is unmatched by way of how it looks. It does a good job of chilling any of the wines you dedicate it to cooling. This Haier 6-Bottle Wine Cellar review pretty much sums up why Haier is such a popular brand among wine enthusiasts who invest in wine coolers to protect their collections. 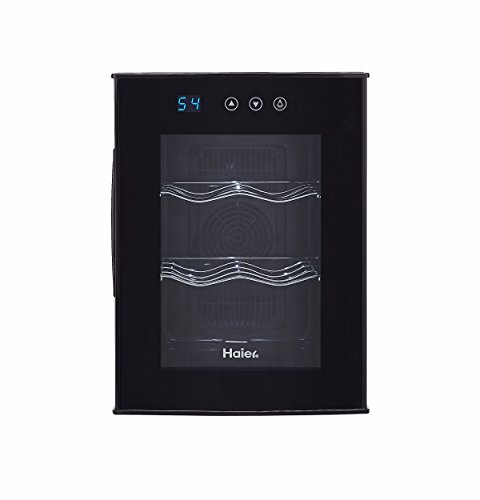 Their products and particularly their wine coolers have become a household name around the world with this cooler doing its bit to maintain the Haier promise of compact design that fits into any wine enthusiast’s lifestyle. It looks terribly good with its futuristic interior lighting, offers an impressive temperature cooling range and simply works well on the countertop. It looks classy, cools wines beautifully and serves as a great companion for a wine enthusiast seeking quick and easy access to a few of their favorite bottles.